Click the Destinations tab in the Timeline panel, and select the destinations_logo layer. 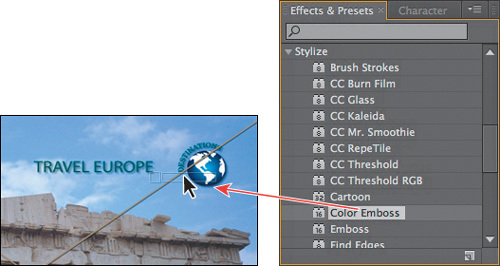 The effect you create next will be applied only to the logo elements, not to the background image of the Parthenon. Choose Effect > Perspective > Drop Shadow. A soft-edged shadow appears behind the nested layers of the destinations_logo layer—the logo graphic, the rotated type, and the words travel Europe—in the Composition panel. You can customize the effect using the Effect Controls panel, which appears in front of the Project panel when you apply an effect. In the Effect Controls panel, reduce the drop shadow’s Distance to 3 and increase its Softness to 4. You can set these values by clicking the field and typing the number, or by dragging the orange, underlined value. The drop shadow is nice, but the logo will stand out even more if you apply an emboss effect. You can use either the Effect menu or the Effects & Presets panel to locate and apply effects. Click the Effects & Presets tab to bring that panel forward. Then click the triangle next to Stylize to expand the category. With the destinations_logo layer selected in the Timeline panel, drag the Color Emboss effect into the Composition panel. The Color Emboss effect sharpens the edges of objects in the layer without suppressing the original colors. The Effect Controls panel displays the Color Emboss effect and its settings below the Drop Shadow effect.